Could there be anything less controversial than religious liberty? Other than extreme reactionaries like ISIS or Donald Trump, it’s hard to imagine who might oppose a person’s right to freely practice their faith and observe their religious customs. In 1948, the UN’s Universal Declaration of Human Rights enshrined the right to religious freedom as one of its most important liberties. And the appeal of this right appears to have gained strength during the last two decades, as a plethora of organizations have sprung up to defend religious minorities from cruel oppression. Think tanks like the Hudson Institute’s Center for Religious Freedom, the bipartisan congressional US Commission on International Religious Freedom, and dozens of other international NGOs routinely supervise the actions of governments and advocate intervention against religious persecution in places such as Myanmar or South Sudan. Religious rights seem to be a matter of rare consensus, both domestically and internationally. What is there to say against them? Quite a bit, as it turns out. Over the last few years, anthropologists, political scientists, and historians have launched blistering attacks against religious liberty. In a series of provocative writings, they have argued that far from being a vehicle for equality, the enforcement of religious liberty discriminates against some groups and in favor of others; it also apparently exacerbates conflicts and imposes unfair restrictions on certain minorities. One needn’t look far for proof of this claim. The European Court of Human Rights has made several spectacular rulings on the issue, such as Dahlab v. Switzerland in 2001 and Lautsi v. Italy in 2011, both of which invoked religious freedom in order to deny it to Muslims. In Dahlab, the court ruled that banning head scarves in Swiss schools guarantees students’ right to be free of indoctrination; in Lautsi, it simultaneously approved the hanging of crucifixes in all Italian schools. The cross, the court maintained, was not a religious artifact but a symbol of European culture. According to critics of religious liberty, this dismal hypocrisy was not a misinterpretation of the law but instead the predictable result of a flawed concept. The problem is that states and courts get drawn into the business of regulating religion in the first place, and by doing so tend to impose their own understanding of the “right” religion, namely that of the majority. At the core of the scholarly assault on religious liberty is an audacious agenda: to use a critique of religious rights to attack secularism as a whole. The most incisive contemporary critics of secularism are not American evangelicals or Catholics, Jews, or Muslims, but left-leaning and often atheist thinkers. For intellectual inspiration, such authors often turn to the renowned anthropologist Talal Asad, whose Formations of the Secular (2003) claimed that secularism and its attendant concept of rights have never been as neutral or liberating as they seemed. Rather, secularism has been closely tied to Euro-American and Christian ideas, and its promotion part of the West’s imperial quest to impose its “universal” principles everywhere and to shape diverse religious communities according to its own conception of belief. For Asad and others, today’s advocates of religious rights, like the imperialist agents of “the civilizing mission” before them, mostly do more harm than good. These radical claims should concern anyone who cares about global politics, law, and public advocacy. They raise many painfully pertinent questions, often without providing an answer: Are religious liberties indeed inseparable from secularism? Is it really impossible to imagine and establish a secular order that would be inclusive rather than discriminatory? And even if so, what kind of political alternative could replace the international promotion of religious rights? If such rights were to suddenly disappear, could their opponents suggest a system that would be less violent and oppressive? Anna Su’s Exporting Freedom explores US efforts to codify religious liberty as a universal principle. American officials, Su claims, fueled by an unwavering belief in their right and duty to foster freedom of worship abroad, were a central force in the proliferation of religious liberty throughout the 20th century by way of agreements and constitutions. These include American advocacy of religious rights in international treaties. Su singles out the 1919 Covenant of the League of Nations, the 1948 UN Universal Declaration of Human Rights, and the 1975 Helsinki Accords, as well as cases of forceful imposition, such as the military occupations of the Philippines after 1898, of Japan after World War II, and of Iraq after 2003. She believes that in all these cases, American insistence on religious rights was not merely a feeble excuse for imperial intervention, but an integral component of a vision of global stability and justice. When US officials obsessed over abolishing Shinto as the state religion of Japan or securing rights for non-Muslims in Iraq, they did so out of genuine conviction that such policies would prompt these former enemies toward peace and prosperity. If this story sounds overly benevolent, Su also sheds light on its far less laudable side. Her most important achievement is to show just how deeply the conception of religious liberty was tied to another American fixation: the forceful promotion of Christianity. The diplomats who worked to secure religious rights did not have a vision of a pluralistic society, in which all religions are equal. Rather, they often thought Christianity to be the core of a “civilized” society, and were primarily concerned with protecting Christians’ freedom to worship, evangelize, and ultimately “uplift” other nations. This was the case, for example, regarding Maj. Gen. Leonard Wood, one of the top US officials in the Philippines and governor of the predominantly Muslim Moro province. Disgusted by local “un-Christian” customs such as polygamy, he swiftly moved to crush Muslim autonomy and disband religious courts—while preserving the rights of Christian Filipinos. The same was true for Gen. Douglas MacArthur, head of the US occupation in Japan. While he insisted on introducing religious freedom, he simultaneously decreed that the first nonmilitary visitors to the surrendered country should be Christian missionaries. The promotion of religious liberty, then, was far from a neutral mission. For many, it was a vehicle for Christianity to displace or at least disempower other religions. Given this disturbingly narrow perception of religion, it’s surprising that Su offers laudatory—and at times almost hagiographic—portraits of some of her protagonists. President Woodrow Wilson’s insistence that religious liberty be a precondition for accepting new states into the League of Nations is portrayed as heroic, despite its many glaring hypocrisies (none of World War I’s victors were subjected to this test). The vocal US support for provisions on religious liberty in the Universal Declaration of Human Rights is equally celebrated, without mentioning that some of its American drafters were missionaries who mostly hoped to use it against communist and Muslim states. Su never quite squares the benevolent American struggle for religious equality with the abject Christocentrism of so many policy makers. How truly universal were the visions of those who so easily equated Muslims, Buddhists, and other religions with “lower” forms of civilization? And what of the fact that the crusade for liberty invariably seems to have been directed against geopolitical enemies, current or former? As decades of denouncing Soviet, Chinese, or Iranian persecution followed, no one suggested exporting religious freedom to US allies such as Saudi Arabia or Israel, neither of which separates church from state and both of which harshly restrict certain religious practices (especially evangelization). Equally important, the meaning of religious liberty seems to have changed over time. When Wilson, for example, sought to promote religious rights, it was with the intention of protecting ethnic minorities like Jews in the new nation-states that emerged in post–World War I Europe. In post–World War II Japan, on the other hand, the demotion of Shinto from its status as state religion served an entirely different purpose. American officials in Tokyo were mostly concerned with eradicating the Japanese people’s alleged sheeplike obedience to the state, which many believed had led to war. What Su sometimes overlooks, then, is that religious liberty was never a stable concept that determined American actions. Like other buzzwords of US diplomacy, such as “democracy” or “nation building,” it was a vague enough banner to accommodate diverse interpretations and meanings, and was always tied to shifting geopolitical considerations. As such, it is not altogether clear whether the routine invocation of religious rights really represents a substantial tradition of American diplomacy or a series of changes and ruptures. And it is crucial to recognize that religious liberty was frequently a secondary vehicle toward achievement of other goals. To be sure, Su is emphatically right in maintaining that Wilson, MacArthur, and others were not cynical agents of expanding American power, but took religious liberty very seriously. They all believed that its exportation was an American task that could do only good. But the differences between them and their political projects were as profound as the similarities. Each had their own idea of religious liberty. While Su is mostly interested in religious liberty’s past, Elizabeth Shakman Hurd zeroes in on its very contemporary implications. Her powerful and brilliant Beyond Religious Freedom focuses on global rights promotion in the last two decades, and includes not only American but also European actors. According to Hurd, since 2001, North American and European officials have singled out religious freedom as the key legal doctrine for combating discrimination, persecution, and intolerance. Anxious over the rise of “political Islam,” they have come to see religion as a titanic and destabilizing force that must be managed. Hurd explores the vast diplomatic apparatus that consequently emerged in Western capitals, from the US State Department’s Office of Religion and Global Affairs to the EU’s Parliament Intergroup on Freedom of Religion. Together, these organs orchestrated a chain of violent (if often overlooked) Western interventions in Latin America, Africa, and Asia. Unlike Su’s ambivalent account, Hurd’s judgment is decisively negative. Beyond Religious Freedom in fact makes for rather depressing reading. According to Hurd, Western policy experts work with a Manichaean understanding of religion. It is as either an enlightened force for the betterment of society or a holdover from the Dark Ages that must be reformed or suppressed. Animated by this childish vision, the West’s secular governments now rush to render theological judgment as to what constitutes “good” religion and what the public purpose of religion should be. They seek to impose this judgment by intervening and choosing sides in local conflicts, often overlooking complex ethnic, economic, and political conditions. 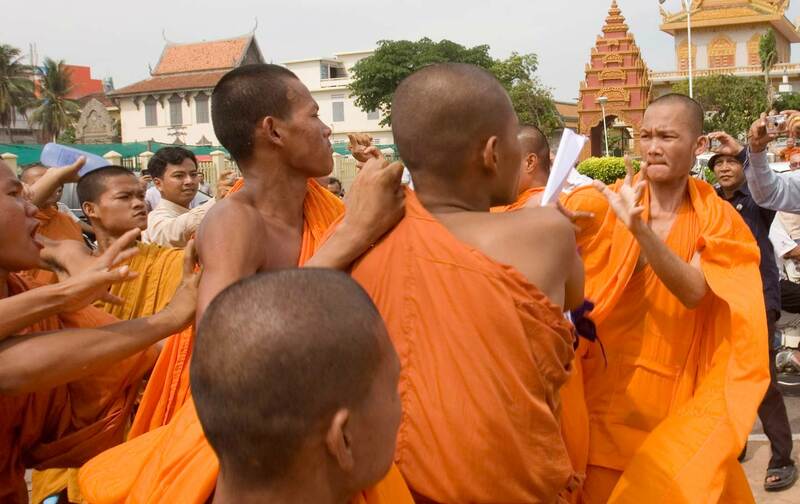 In Myanmar, for example, clashes between the majority Buddhist population and the minority Rohingya people—typically Muslim—involve disputes over land, language, ethnic identity, and much more. But for the Western governments that have intervened there, the conflict has typically been seen as a religious war between Muslims and Buddhists. Consequently, an embrace of religious freedom would seem to offer a way to end the dispute. Hurd claims that limiting the conflict to a matter of religious difference has insidiously allowed the Buddhist elite to feign a tolerant attitude without having to address the underlying racial, economic, and political factors contributing to the long-standing turmoil. More fundamentally, Hurd argues that Americans and Europeans broach the issue of religious freedom through a restrictive Protestant perspective. They reduce religion to a matter of personal belief rather than, say, participation in a specific type of community involving rituals and practices, Christian or not. And in doing so, they mostly reflect their inability to understand other societies. For most people, after all, religion is a complex blend of belief, custom, and rites. This is a potent challenge to religious freedom, and should be taken seriously. Even if her view of Protestantism is inaccurate (when have devout Protestants ignored ritual or community? ), Hurd helpfully questions its universality as the center of religious freedom. But she sometimes goes too far when she argues that religious freedom itself is the cause of persecution. In her view, “contemporary international religious freedom advocacy not only protects particular kinds of religious subjects, but also helps to create individuals and faith communities for whom choosing and believing…[are] the defining characteristics of what it is to be religious. Such is the case with Copts in Egypt, the Ahmadis in Pakistan, and the Alevis in Turkey. Their indeterminate cultural and social identity has been reduced by recent EU interventions to a principle of mere religious difference. Hurd maintains that it was this Western influence that transformed these groups into apostates and insurgents. By isolating religion as the main variable, European and North American policy makers have variously exacerbated or created tensions. This part of Hurd’s claim doesn’t do justice to the historical record. After all, many of these conflicts began many decades before the recent promotion of religious liberty. This is true especially in her account of the Middle East, where Western powers invoked minorities’ protection from the late 19th century and throughout the 20th; the Berlin Congress of 1878 and the League of Nation mandates in the 1920s enshrined this habit in international law. It is in no way obvious that the recent obsession with religious liberty actually led to the interventions she explores. One could argue just the opposite: that Western officials only are more prone to invoke the term in order to justify foreign invasions to their domestic constituents. It is also unclear whether Western conceptions of religion leave any mark beyond its borders, either among minorities or majorities. Persecuted Yazidis may cite religious rights when seeking Western protection from ISIS, but that doesn’t mean that either they or other Iraqis change their habits or ideas. Hurd repeatedly resorts to the rhetorical gesture of stating that she has no specific policy proposals to remedy the tragedies she depicts. She never says whether policy makers should recognize the complex social, economic, and territorial factors of religious strife, or instead abandon the entire concept of religious liberty. The book’s title and tone suggest the latter. But Hurd offers no reason as to why religious persecution and other forms of oppression cannot be opposed at the same time. Is it truly impossible for policy makers to think of religious and ethnic/national conflicts as intertwined? Further, if states were to develop a new definition of religious rights that would expand the definition of religion beyond their present narrow form, would Western meddling be less destructive? Is the problem religious liberty, or the issue of foreign intervention? In contrast to Su and Hurd, who are mostly interested in the doings of the powerful West, anthropologist Saba Mahmood focuses on those on the receiving end of its authority. In her excellent Religious Difference in a Secular Age, she describes select non-Western experiences of the politics of religious liberty. In contrast to Hurd, who jumps from one continent to the next, Mahmood concentrates on two case studies of minorities in Egypt: the plight of Coptic Orthodox Christians and Baha’is. Like Hurd, Mahmood is convinced that the West’s importation of religious freedom had only worsened these minorities’ conditions and exacerbated inequality. But the reasons are not to be found in the wake of 9/11. Rather, they lie in the long history of Western imperialism, and even more disturbingly in secularism itself. According to Mahmood, the people of the Middle East lived reasonably well without religious freedom. Even though the Ottomans, who ruled the region for centuries, took it for granted that Islam was superior to all other communities, they allowed substantial autonomy to minorities. This was particularly true for Jews and Christians (known to Muslims as “People of the Book”), who were legally and financially discriminated against but were allowed to run their own family courts and follow their rituals. But after the collapse of the Ottoman Empire, Western governments and organizations (especially missionaries) forced on Egypt their secular conception of religious equality and rushed to defend certain (surprise!) Christian minorities. The tragic consequence was the intensification of religious conflicts. Muslims, who were anxious to defend their authority, harassed non-Muslims. Indeed, for decades, the Egyptian government has shown an astonishing appetite to humiliate its minorities. As recently as the mid-2000s, for example, it banned its Baha’i citizens from obtaining basic documents such as passports, birth certificates, or bank cards. This is where many will be less convinced by Mahmood’s argument. Even if one overlooks her idealization of Ottoman rule (which was deeply repressive long before Western influence was exerted), it is still unclear why secular regimes cannot be pluralist and embrace diversity as their core principle. Is it truly impossible to imagine a secular regime that does not impose the majority’s norms and is inclusive rather than exclusive? Without a doubt, recent legal rulings in Europe that make Christianity the norm and exclude Muslim norms are outrageous. But should it preclude envisioning other legal norms that would replace them with a much more tolerant system? Moreover, even as Mahmood is correct to highlight how regimes discriminate in favor of the majority, the nature and scope of such discrimination is actually crucial and qualitatively different. Forcing kids to see crucifixes in schools (in Italy) is not the same as preventing religious minorities from having government IDs (in Egypt). One is an irritation, if not a personal affront, and the other a terrible disruption of everyday life. To be sure, criticizing the West’s hypocritical claims to neutrality remains a vital undertaking. But comparing Europe to the Middle East can make one wonder whether the promise of secular citizenship is indeed equally bleak everywhere. Perhaps the most glaring problem with the attacks by left-leaning scholars on religious freedom is the reactionary ends they may wind up serving. Even though Su, Hurd, and Mahmood oddly never mention it, there has been a vibrant Western tradition of opposing religious liberties, which was spearheaded by conservative Christians. Perhaps no institution has lambasted the concept more than the Catholic Church, at least until the 1960s. Like today’s leftist critics, the pope and his followers were convinced rights were meant to weaken God’s community and subject it to individualist and Protestant principles. And more recently, it was American conservative Protestants who claimed that time has come to do away with the secular separation of church and state. Secularism, they lamented, was never neutral, but actively persecuting religious communities. This is not to engage with guilt by association, as today’s scholars have a very different agenda. But their persistent resistance to articulate an alternative to religious rights poses a considerable danger. What, exactly, are the political and legal mechanisms that should replace religious freedom? If states were to recognize its imperfections and abolish legal protections, what would prevent supporters of theocracy from inflicting even worse oppression on minorities? Can we be sure that a world beyond religious rights will witness more inclusion? After years of blistering attacks on religious liberty, perhaps the challenge is to move beyond critique and offer concrete steps for political and institutional reforms. Su, Hurd, and Mahmood may not explain how to begin fulfilling this task, but they do show how urgent it is. Udi GreenbergUdi Greenberg is an associate professor of history at Dartmouth College. He is the author of The Weimar Century: German Émigrés and the Ideological Foundations of the Cold War (Princeton, 2015). Daniel Steinmetz-JenkinsDaniel Steinmetz-Jenkins is finishing a dual PhD in modern European history at Columbia University and Sciences Po (Paris). He is the editor of The Immanent Frame.